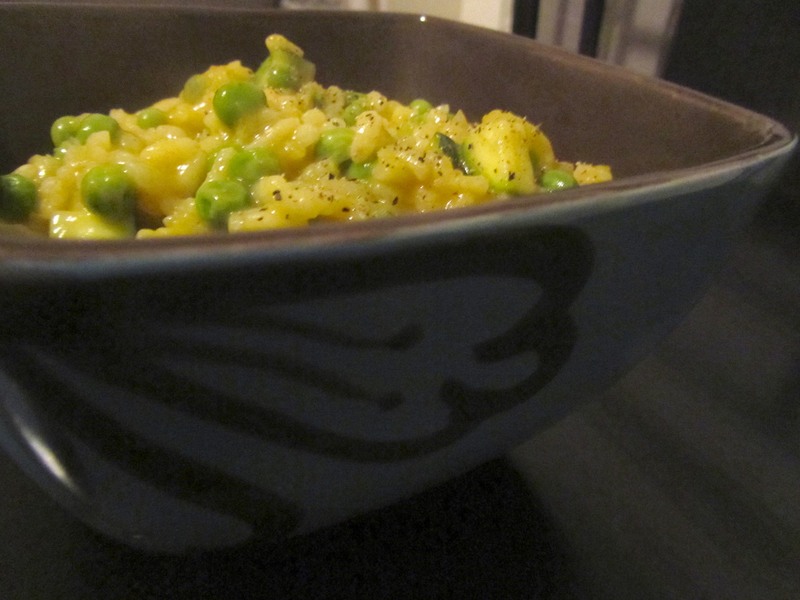 I remember the first time I ever made risotto. Lindsey and I were visiting our aunt in California, and helped her make risotto for dinner. At the time, it seemed like a very long, laborious process, but now I really enjoy making it. I also just love risotto! It’s creamy and delicious. 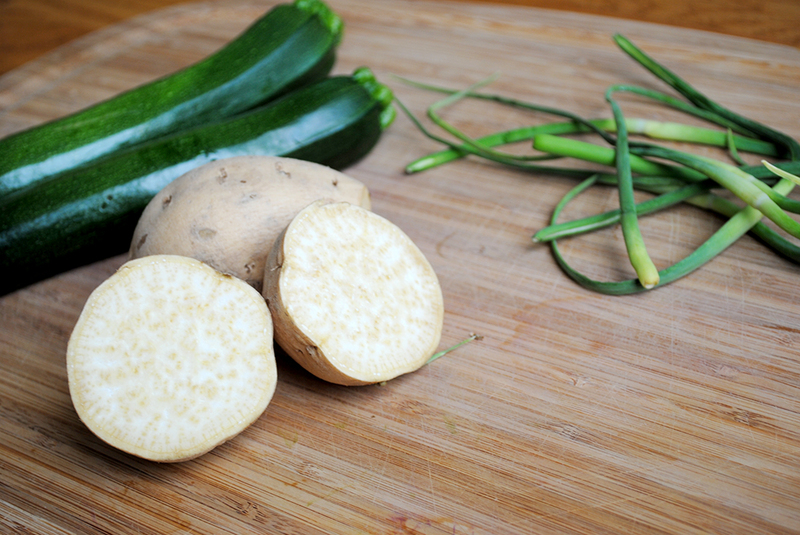 This recipe can be made using different vegetables, and would be great with some herbs thrown in. It should include 1/4 cup of fresh mint. Unfortunately for me, the herb selection when I went grocery shopping was less than fabulous. I’m posting what I made, but encourage you to take creative liberties! Combine the broth and wine in a saucepan over medium heat. Bring to a simmer, and maintain over low heat. In a heavy-bottomed saucepan, melt the butter and 1 tablespoon of the oil over medium heat. Add the onion and saute until softened, about 4 minutes. Add the rice and cook, stirring constantly, for about 1 minute, or until all grains are coated. Add 2 cups of the simmering broth mixture and cook, stirring frequently, until the liquid is absorbed, about 3-4 minutes. Reduce the heat to medium-low. Add another cup of broth and cook, stirring occasionally, until liquid is absorbed. Repeat until all broth has been added. 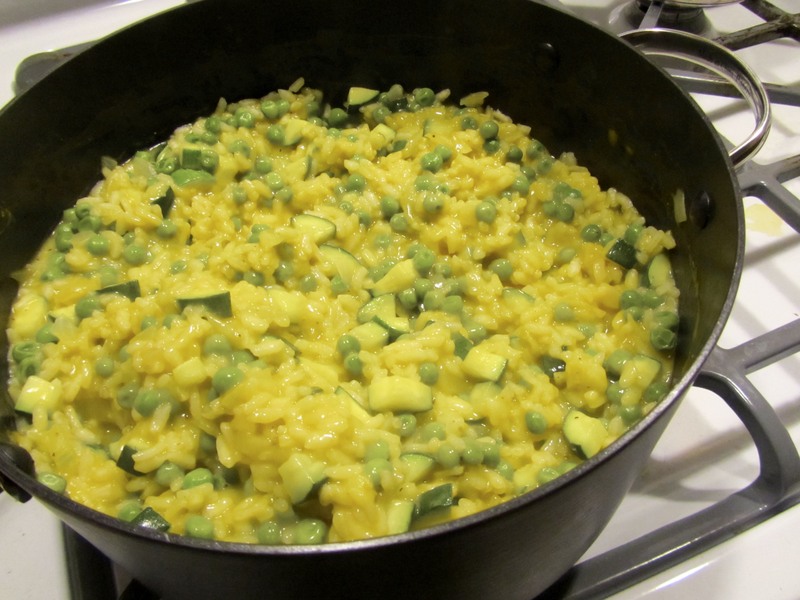 While the rice is cooking, warm 2 tablespoons of olive oil in a large frying pan over medium heat. 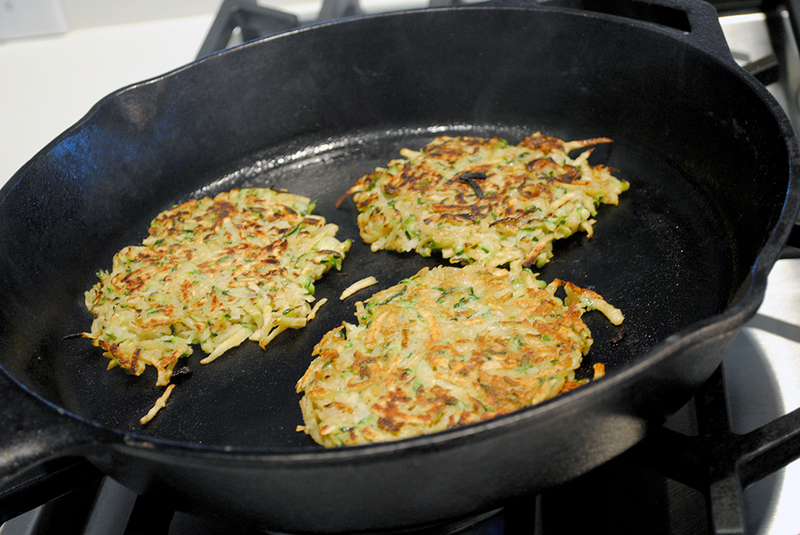 Add the zucchini and saute until softened, about 4 minutes. Stir in the peas, cooking until heated through, about 3 minutes. Remove from heat. After about 20-25 minutes, when the rice is tender and creamy but still al dente at the center, stir in the sauteed vegetables. Cook for 1 minute to heat through. Stir in the cheese, then season with salt and pepper to taste. Great big pot of rice! This was a great, filling recipe. It makes a sizable batch, so I had plenty of leftovers for lunches. So convenient! 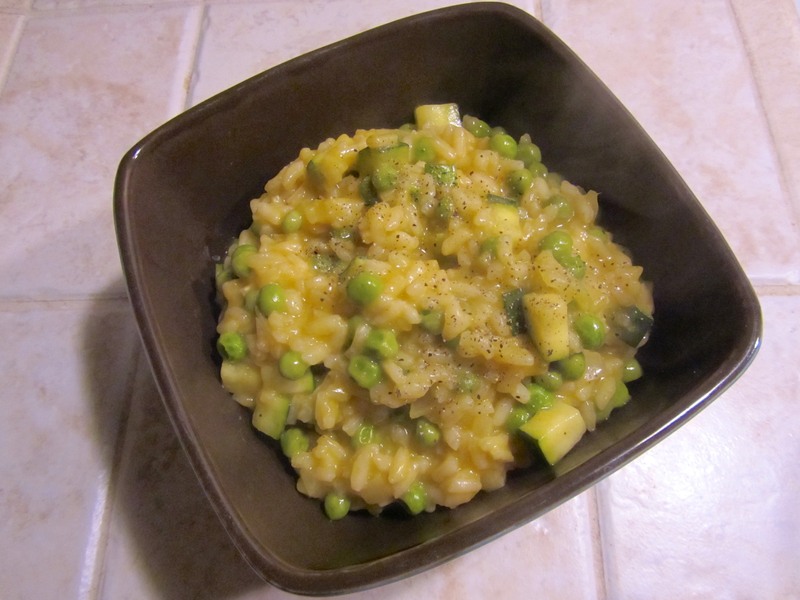 Have you ever made risotto before? What is your favorite kind? I feel like I’ve been living in La La Land lately. I’ve been able to dance and work out every day! Somehow, even though my workload has been pretty light, I’ve had a packed schedule. I’m not complaining, but it means I’ve had less time to cook nice meals. The solution to my time constraints? Eggs. I love eating eggs for dinner. 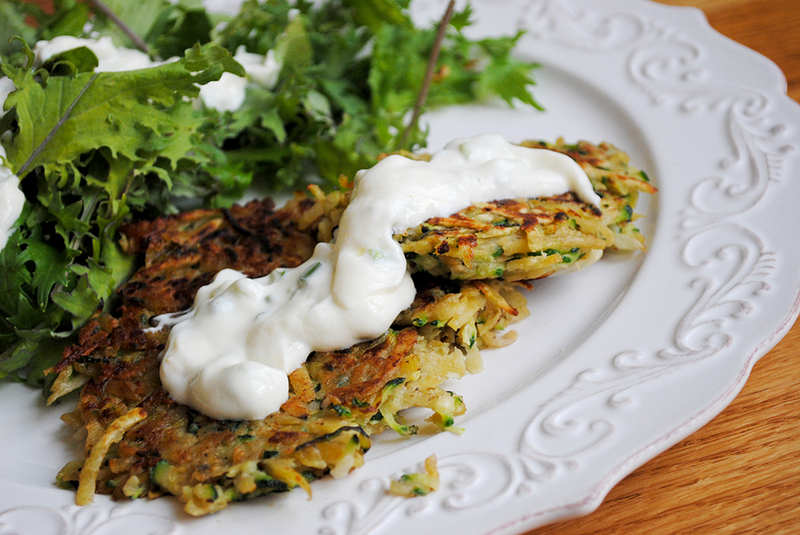 They’re tasty, protein rich, and quick! Last week, I combined a favorite recipe from Williams-Sonoma, Polenta with Vegetable Ragout, with some nice fried eggs for a wonderful brinner (breakfast for dinner) plate. 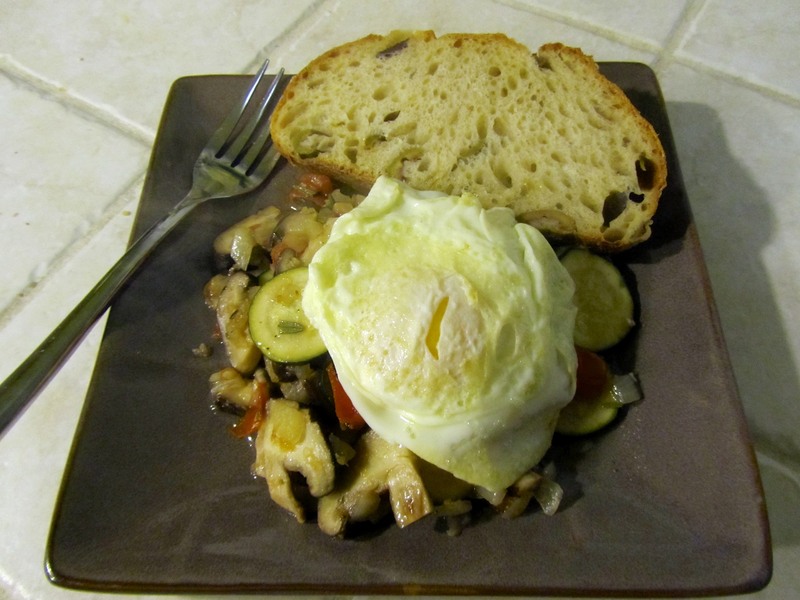 I wasn’t in the mood for polenta, so I served the vegetable ragout and eggs with a slice of olive bread from the Acme Bread Company. In a large frying pan, heat 3 tablespoons of the olive oil over medium heat. Add the onion, and saute until softened, about 4 minutes. 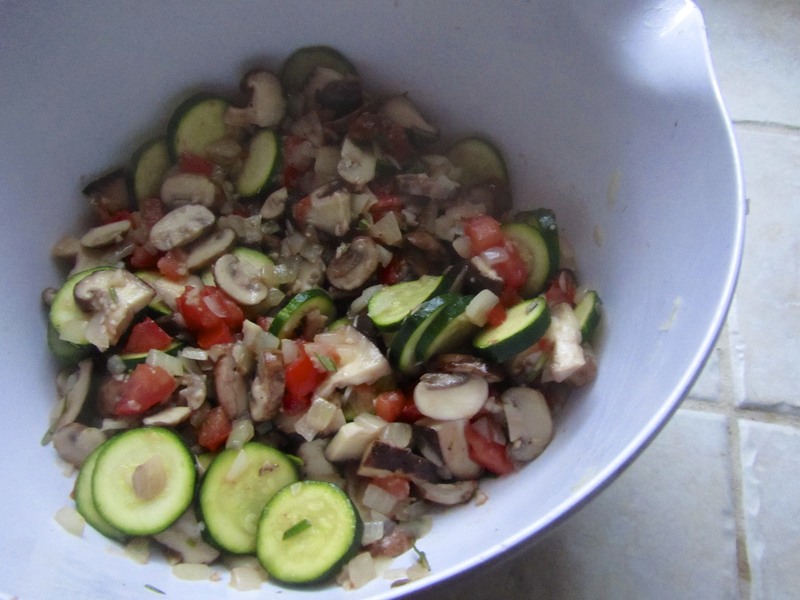 Add the garlic, zucchini, and mushrooms. Cook, stirring occasionally, for 4-5 minutes, until vegetables are softened. Add the tomatoes, rosemary, sherry, and salt and pepper (about 1/2 teaspoon each). Cook, stirring frequently, until the tomatoes release their juices and soften, about 3-4 minutes. 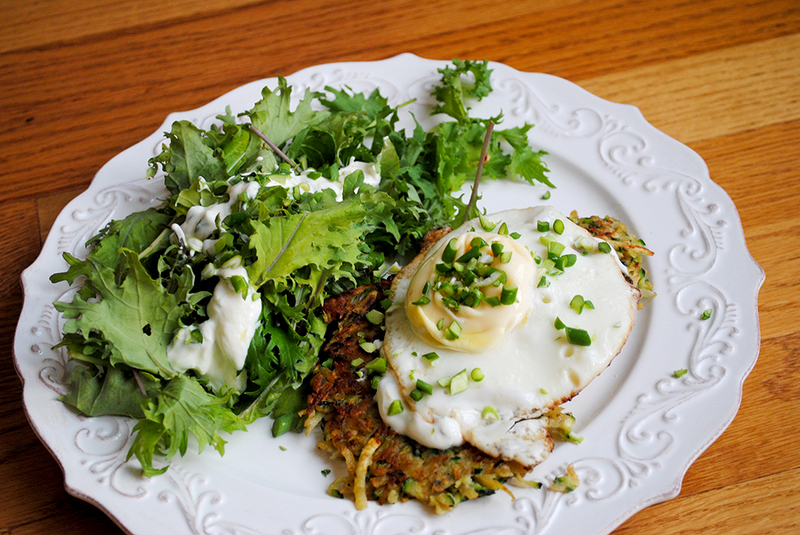 In a separate frying plan, fry the eggs 1-2 at a time. 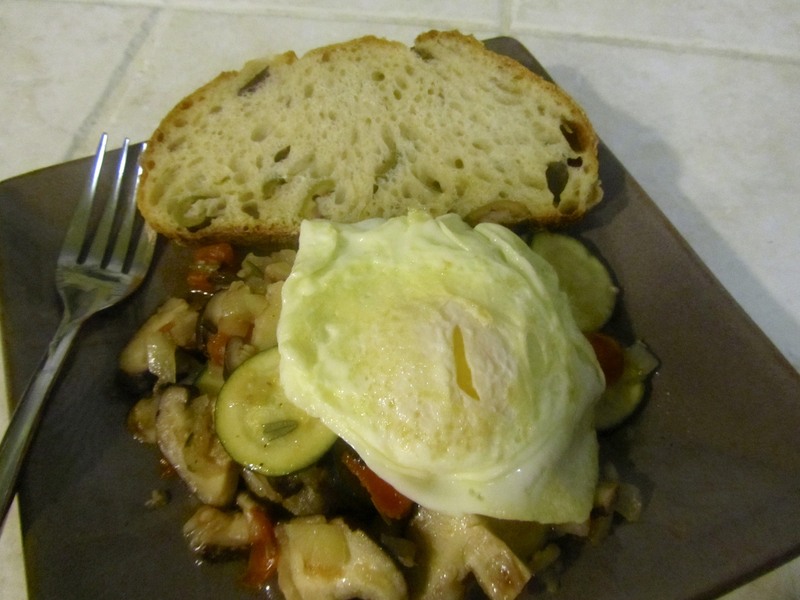 Serve the ragout topped with 1-2 eggs and a slice of bread. I could eat this ragout all the time! 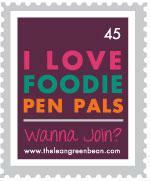 The vegetables are delicious, and the sherry and rosemary flavors come through really well. 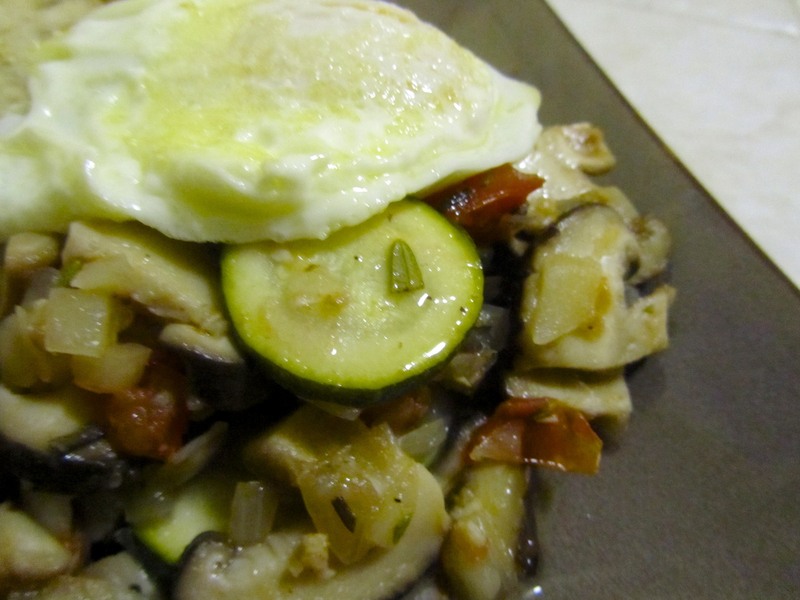 I prepared the ragout early in the week, and was able to quickly toss a meal together the rest of the week by cooking up the eggs while reheating the vegetables. So simple!